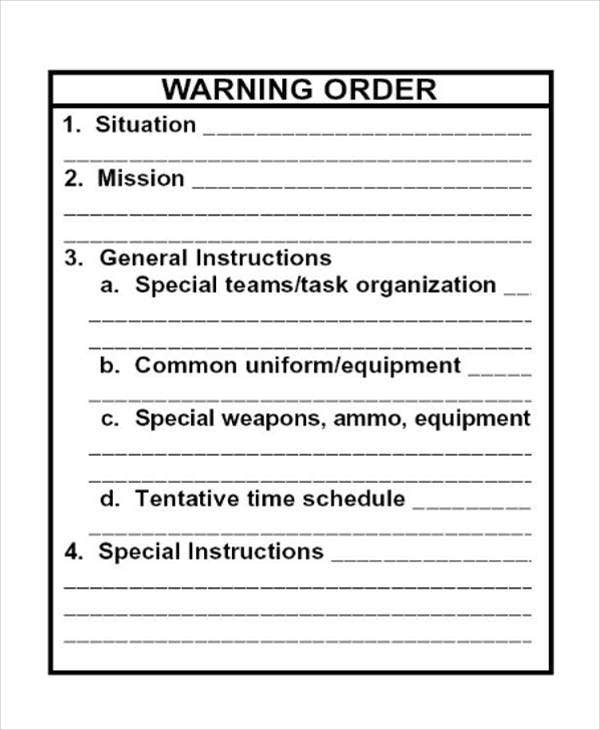 Warning order, or WARNORD, is a type of notification letter that informs military units that an operation order is forthcoming. It is issued to the unit leaders immediately right after the receipt of the unit’s mission from higher have been presented. 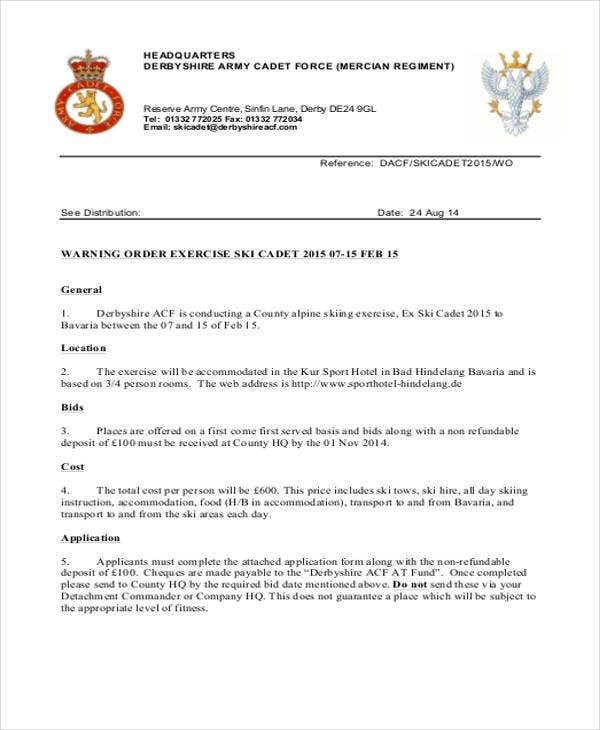 This note is to alert and prepare the military subordinates into developing their own warning and operations orders based on the information carried within the WARNORD. 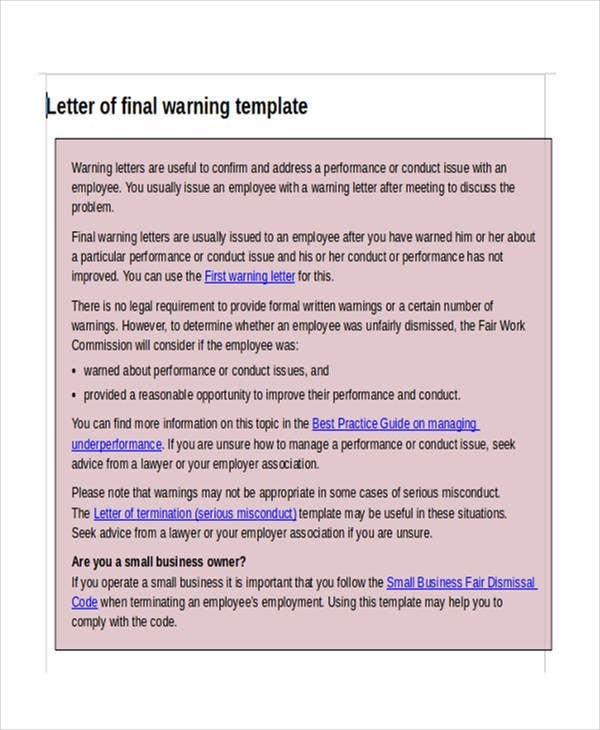 However, in this article, there are other warning order templates that pertains to a different warning note, like for example, professional/work warning notes or perhaps a warning in regard to an organization’s damages. 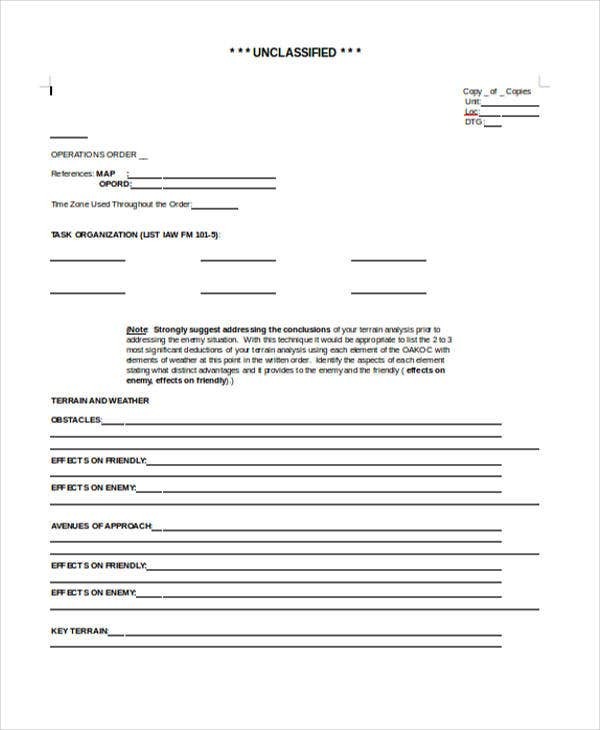 If you are planning to create a WARNORD letter, you might want to check out these 5+ Warning order templates for your letter format ideas on your letter draft. 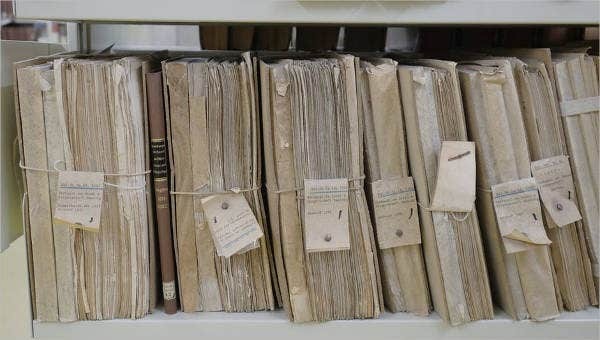 The files can be downloaded in PDF file and are print-ready as well. Situation. 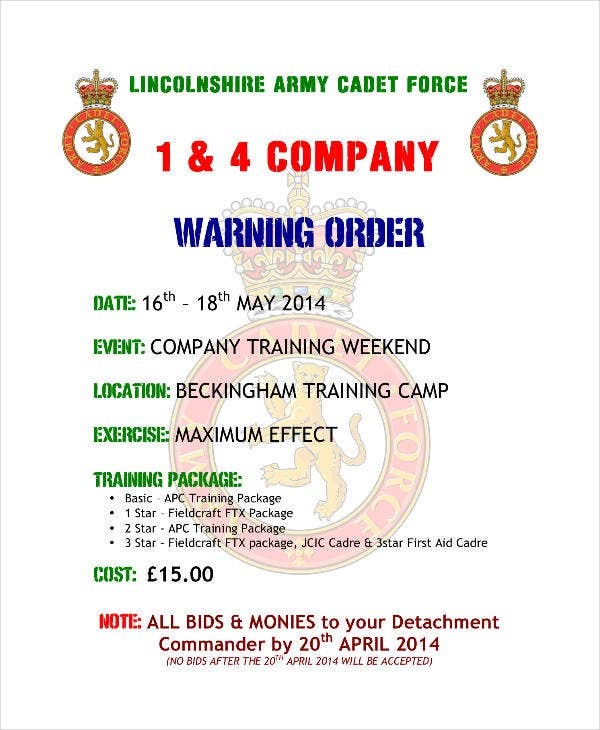 It is important to write down the possible scenarios that the subordinates are going to face. It will also discuss about the necessary actions to make for each possible scenario and forces (enemy forces, friendlies, attachment and detachments) and materials to prepare for the actual ground activity. Mission. This discusses about the 5 Ws—who, what, when, where, why—of the mission and clearing out the objectives and planning how to reach the desired end state. Be mindful to always repeat the mission twice. Execution. This includes information about how the actual mission is going to take place. This will also imply the actual plan on how to reach the mission’s target. Command and signal. This will serve as an alert or a notifier when they will release the attack. This also implies the necessary armors and equipment to bring during the actual combat; they will also be guided on how to get the equipment for the operation. Service and support. This signifies that a command structure will be given during the operation, call signs, frequencies, and other relevant information. An example of this is to ask the TL to bring the needed radios, antennas, and fills, if you are planning to work on satellite communication. How Can I Download and Use These Warning Orders? You can download these files in PDF form, hence they are print-ready. You need to just click the Download button, and it will directly be saved into your download folder. 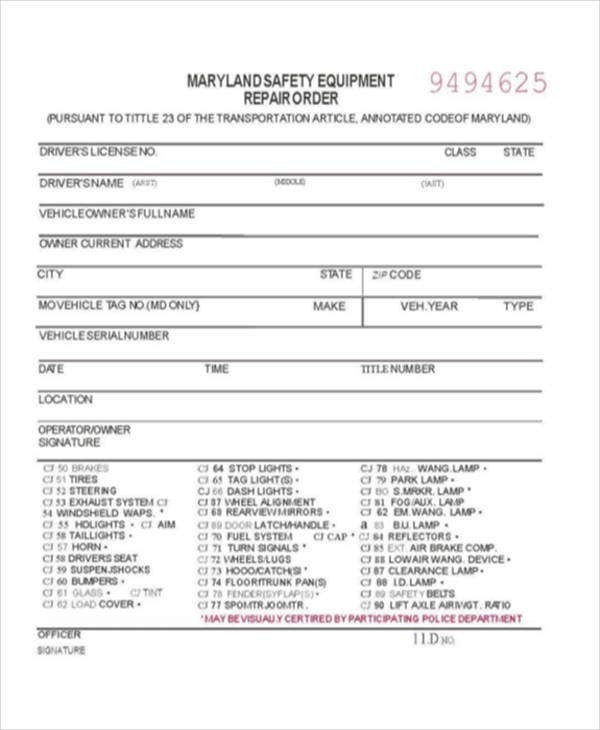 For more order note samples, you might want to check out Repair Order and Blank Order. Looking for More Functional Template Samples? Check Them Out Here!